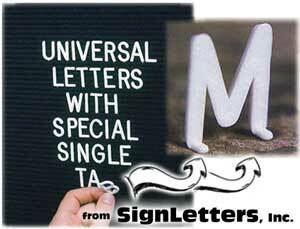 We offer the tab style changeable reader board (directory) sign letter sets as shown below. Our readerboard letter kits (directory letters) are for use on either the small portable changeable message signs or on the larger directory units like the changeable signage seen at malls, on fast food restaurant signs, banks, convenience stores, etc. Tab letters used on directories are very common and replacement letters for these readerboards are often needed, but many people may find that these plastic directory letters are hard to find. We have a solution for your business getting your kit of replacement directory letters... Our universal tab directory letter sets. 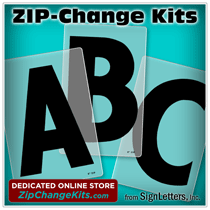 Our plastic tab style changeable letter sign kits will work with almost any common directory lettering system or changeable reader board in use that requires tabbed letter kits. Let us know of any questions you may have about our change tab type reader board lettering kits.